I have another fun card making kit to share with you today. Are you ready for 12 handmade cards in 3 designs you can make in 30 minutes?! This one is found in the Occasions Catalog on page 20 and it’s gorgeous!!! It’s super easy and it’s the perfect card making kit for beginners or someone who just wants to make up a batch of cards quickly to have on hand for when needed. Card making kits make it easy to be prepared for when you need a card and just don’t have time to create. In today’s video I give you an up close look at the cards in this kit, as well as make one of each design for you. If you are reading this in your email, the video might not show up. Just click below to go to YouTube to view it. Made to Bloom is an all-inclusive kit so it contains the stamps, ink and even a block. Perfect if you have very few supplies on hand to create it! Fall in love with card making with these 12 Handmade Cards in 3 Designs You Can Make in 30 Minutes. You DESERVE to have that 30 minutes of ‘me’ time!! Here are the cards the kit makes. You get all the supplies to make 4 of each design and can mix and match the greetings if you need more of one kind or the other. 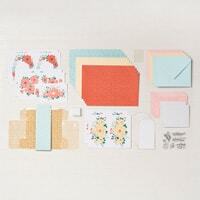 They even have super pretty envelopes to go with the cards in this card making kit! Sorry that these pictures are not the greatest. It was hard to get good pictures with the “gold foil.” Make sure to watch the video because you can see the cards better and how nice they are. Which card today is YOUR favorite?? Have you tried a card making kit before? I’d love to hear your thoughts! Let me know if you have any questions; I’m always here to answer them! I truly appreciate it! Would you like to purchase this kit? Just click the picture below to go to the online store. You truly will love this kit. I picked up a couple extra to have on hand to give away as gifts when I need one! Perfect for that friend who has everything, or hasn’t really gotten into making cards yet! This just might get her hooked! There are many ways to earn FREE PRODUCTS during Sale-a-bration. Figure out what is best for you and how you can get the best deal on all the products you love. NOW is the time to join Stampin’ Up! Whether you are a hobby stamper wanting a discount on all your products, or you are looking to start a business–NOW IS THE TIME. With every $50 you order you get to select a FREE ITEM out of the Sale-a-bration Brochure! If you don’t have the brochure, you can CLICK HERE to view it online. Whenever you place an order that is over $250, you will receive an additional $25 in Stampin’ Rewards! So, with an order of $250, you will get $50 in FREE PRODUCTS of your choice PLUS 5 FREE items from the Sale-a-bration Brochure!!! Holy smokes–that’s a lot of FREE PRODUCTS! As always–I am here to help you in any way that I can. Please contact me if you have questions, need help with an order, or I can do anything for you! When ordering from me this month, besides the FREE PRODUCTS you can earn, I also will email you this super fun set of tutorials using theWonderful Romance stamp set bundle as a special THANK YOU for picking me to be your demonstrator.